A single folding chair for sale with two slight scuff marks to the seat frame. 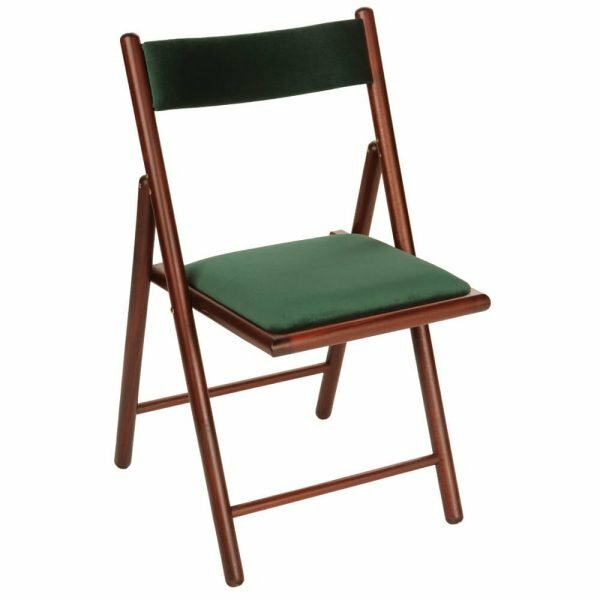 This single Knightsbridge folding chair for sale is ideal for your bridge games or any time you require extra seating. A comfortable green velvet padded seat and back rest complement the mahogany lacquer over the hard beech wood. As a result the finish co-ordinates with the colour of our luxury folding side tables, Oxford card tables and Marlborough card tables so that you can have a smart matching set. Furthermore these folding chairs are quick and easy to assemble and put away. Once they are up, the framework provides you with a sturdy seat. Once the chairs are folded, the size of them is minimal, so they are easy to store when not in use. Dimensions in use H81 x W45 x D56cm. Weight of each chair 4.8kg. The seat has a slight incline, so the height from the floor to the top of the cushioned padding ranges from 46 to 47.5cm.